Do you think you can get your kids to try watermelon salad with pickled red onions? Or a Moroccan sweet pancake? 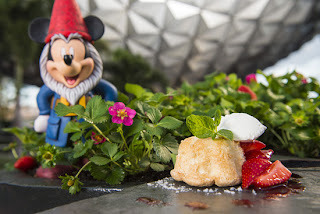 The Epcot International Flower & Garden Festival chefs have chosen some fun dishes to encourage youngsters to try something new as part of Disney’s TRYit campaign. TRYit is part of Disney’s Magic of Healthy Living initiative, partnering with parents to inspire kids to try new foods and new activities. You’ll see TRYit dishes all throughout the World Showcase Promenade. The festival is a fun way to try small bites of something new. To learn more about TRYit and Disney’s Magic of Healthy Living, visit the Magic of Healthy Living web site. 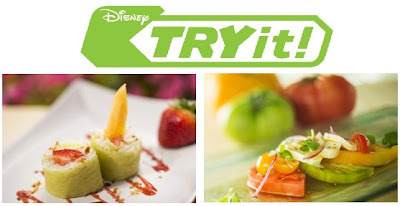 And here’s one of the TRYit recipes from the Epcot chefs – super-easy to “try it” at home. Combine white balsamic vinegar, shallots, garlic, honey, and lemon juice in a blender. Blend until well combined. With blender running, slowly drizzle in olive oil. Blend until thickened. Season to taste with salt and pepper. If using frozen raspberries, thaw. Purée raspberries in a food processor. Pour purée through a fine-mesh sieve. Discard seeds; set puree aside. Combine raspberry purée, water, sugar, grenadine, and salt in a medium saucepan over medium-high heat. Simmer 5 minutes, stirring to dissolve salt and sugar. Add onions; stir to coat, then remove from heat. Set aside 20 minutes. Divide watermelon among plates. Toss arugula with white balsamic vinaigrette in a medium bowl and lightly season with salt & pepper. 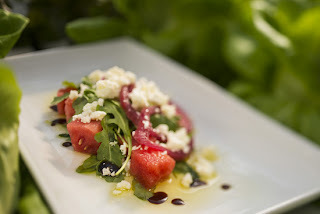 Top each portion of watermelon with arugula. Top each serving with 2 to 3 picked onion rings, then sprinkle with feta. Drizzle with balsamic glaze. Cook’s Note: Balsamic glaze can be found in most supermarkets on the oil and vinegar aisle. To make your own, place 2 cups balsamic vinegar in a small saucepan over medium-high heat and simmer until reduced to 1/4 cup, about 40 minutes.